This would be a fantastic gift idea for a little one on your holiday shopping list! Not only is this toy fun, but it helps with educational aspects as well! You can get the ALEX Jr. Maxville Wooden Activity Cube for only $39.87 today on Amazon! That is a savings of 64% because this activity cube is normally $110.50! Make sure that you snag this deal soon because the prices can change on Amazon at anytime! 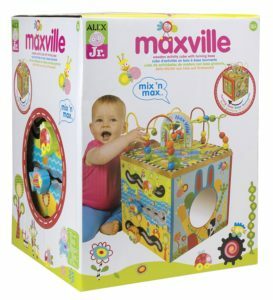 CLICK HERE TO ORDER the ALEX Jr. Maxville Wooden Activity Cube for only $39.87 today!